ibus-anthy 1.5.10 is released and it’s now avaiable in Fedora 27 or later. The emoji dictionary is updated for emoji 5.0 and 11.0 beta. This release replaced IBusConfig with GSettings so you have to run `glib-compile-schemas /usr/share/glib-2.0/schemas` after you run `make install` in the ibus-anthy build directory. 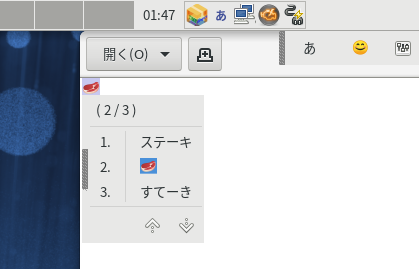 ibus-anthy also implements a new shortcut key Shift+F7 to convert all the preedit sequences to Katakana. Original article title: Takao Fujiwara: ibus-anthy 1.5.10 is released. This full article can be read at: Takao Fujiwara: ibus-anthy 1.5.10 is released. Fedora Badges: New badge: LFNW 2017 !